Black cloth with gilt titles to spine is very clean and neat. Dust wrapper has the tiniest hint of rubbing and one very small surface scratch. Hardback. 224pp. Reprint. 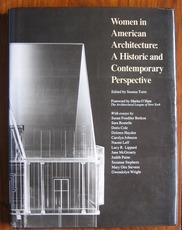 Publication and exhibition organised by the Architectural League of New York through its Archive of Women in Architecture. With essays by Naomi Leff, Susan Fondiler Berkon, Sara Boutelle, Doris Cole, Dolores Hayden, Carolyn Johnson, Lucy R. Lippard,Jane McGroaty, Judith Paine, Gwendolyn Wright among others.